From the Editor: One of the things that makes the National Federation of the Blind the effective organization it has become is the willingness and ability of individual members to do the jobs that come to hand and not assume that someone else will take care of them. But sometimes people tell the chapter or affiliate president about an article or interview that requires a response in the hope that the official will write the necessary letter. Speaking now as a state president, I will confess that I find it nearly impossible to write effectively when I do not have accurate information about the original situation. It just works better when the person who understands the problem and cares about the solution takes the time to address it on behalf of the National Federation of the Blind. It is discouraging to me, though not for the reasons that some people may think, to hear an interview with Henry Grunwald and read a passage from his book, Twilight: Losing Sight, Gaining Insight. Mr. Grunwald gets attention due to his employment as editor of Time magazine and his literary ability when describing his life situation, losing his sight due to macular degeneration. The interview was with Diane Rehm on National Public Radio, and an excerpt from the book appeared in the Washington Post on July 18, 2000. I too am blind. Since I do not feel discouraged about my own life, I do not feel discouraged about Mr. Grunwald's oncoming blindness. The thing that makes me discouraged is that this man, with all his abilities and achievements, has not found the ideas that could release him from his mental anguish and help him arrive at a different and more constructive understanding of his situation. I am also discouraged by the people who selectively find the passages that emphasize the tragic view of blindness which is the view that most of the world takes. There is another approach. The real problem of blindness is not the lack of eyesight; the real problem is the lack of understanding and information which exist. If a blind person has proper training and opportunity, blindness is only a physical nuisance. This statement is one of the central pillars of the National Federation of the Blind. I am sure that this statement sounds strange and impossible to many people. When I learned this idea, and I learned it gradually, it became true in my life. I know many other blind people who have made it come true in their lives. There are 50,000 of us in the NFB. Seeing is thought to be the key to freedom and independence, but there are other ways of fulfilling the needs for freedom and independence. That is what we mean by "proper training." There are other ways to do things, but these ways must be learned. Three orientation centers in different parts of the country are dedicated to the principles of the NFB, where blind adults can go for a few months to learn the new techniques of living. Just as with any other change in life circumstances, one must learn new ways to handle the tasks of life. Because loss of sight and blindness have such negative associations, it is tempting to disdain the new ways. If we disdain the new ways because they are part of the feared and hated condition, blindness, we are the ones who lose. Mr. Grunwald has already made a good start on the reading techniques, employing readers and listening to a radio reading service. There is another way to read newspapers that might be useful. It is called NEWSLINE for the Blind�, and it is a service of the National Federation of the Blind. The access device to use NEWSLINE is any touchtone telephone. Among the features of this service are the abilities to skip from article to article, spell words, repeat, skim, jump ahead, and adjust the reading speed. I used NEWSLINE for the Blind to read the excerpt from Mr. Grunwald's book that was in the Washington Post, and it was at the time of my choice. NEWSLINE is in seventy cities around the United States. There is no doubt about it. If you absolutely must see some things--the sunset or your grandchildren's faces--and life has lost its meaning because you can no longer see them, you had better go out and cut your throat right now. Of course I do not advocate that action. No individual can have every experience in life. Some things are very beautiful and can only be experienced by sight. Other things are important and can conveniently, but not only, be experienced by sight. Some of the things that I would like to see are not much more than candy for the eye. They would be nice, and I miss them. In general, missing the eye candy does not impoverish my life. My wife and I raised our two daughters in a good part of town and sent them to college. During the process we had many enriching experiences along with the normal range of pains and joys. No, I can't see a woman's figure. Yes, I can flirt with the ladies of my choice. No, I can't see the color of my clothes. Yes, I have sighted friends whose wives tell them that they don't make good matches of shirts and ties. No, I can't see to read and write. Yes, I can read and write in Braille as well as on my computer equipped with a speech-output program. This letter is some evidence in that direction. No, I can't see a smile. Yes, I can hear a smile in a voice, as Mr. Grunwald says he can, and I can also remember the admonition that a man may smile and smile and be a villain. I will not try to answer every point raised in Mr. Grunwald's book nor advise him on every necessary technique to live a full life. I invite Mr. Grunwald to learn more about the National Federation of the Blind. We have been through the process of sight loss, learned the physical and mental techniques of adaptation, and come out on the other side. Had he been in Atlanta during the first week of July this year, he could have met 2,400 members of the National Federation of the Blind at our convention, where there were blind smokers to advise him on cigar lighting techniques. There were also plenty of people who were losing their sight due to macular degeneration. Over fifty special interest groups held their small meetings. The students put on a play. Those with musical talent held a talent show. The lawyers reenacted a trial. Business people talked business. Industrial workers talked shop. Office workers talked office politics. Parents of blind children talked about educating their children. Writers talked about how to get published. There were four days of general sessions and a grand banquet. We met old friends and made new ones. We visited the local sites. What else do people do at conventions? Most important, there would have been the opportunity to meet people from all parts of the country and every possible background who came together to change what it means to be blind. 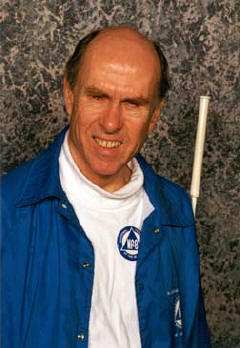 To learn more about the National Federation of the Blind and NEWSLINE for the Blind go to <www.nfb.org>. By mail write to National Federation of the Blind, 1800 Johnson Street, Baltimore, Maryland 21230, or call (410) 659-9314.